Water is a recurring feature in her work. She designs and produces fountains, drinking fountains, and sculptures incorporating water in collaboration with landscape architects as well as with water engineers. Her pieces and series often perform functional and environmental comfort roles: providing drinking water, light, or warmth. She uses select quality chamotte material in her work, glazed in hues to fit seamlessly into their environment. The ceramics, glazed and fired at extremely high temperatures, becomes both frost and chemical resistant. They are compatible with medicinal waters, drinking water, and chemically treated water, while having easily cleaned surfaces. The SOURCE fountain is a unique functional sculpture, in combination with water. A unique functional sculpture designed for the tropical flora of the Széchényi Medicinal Bath, Palm House. The sculpture grouping is made of unique pieces set in a pool, some structuring the space, while others create a babbling effect in the stream’s flow. This multifunctional urban furniture can be used as seating as well as fountains, with optional integrated light fixtures and multiple possible configurations. 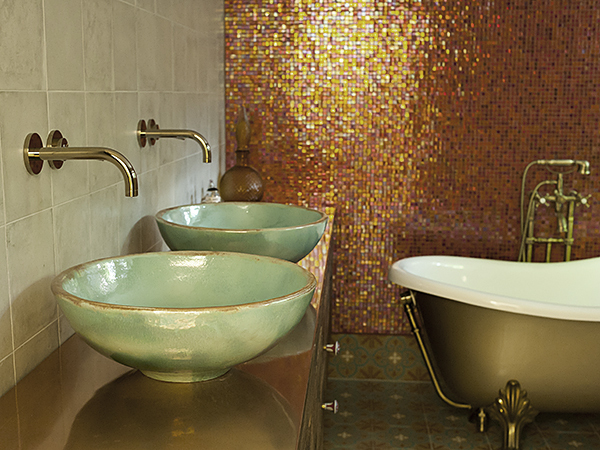 The hand shaped ceramic bowls bring a piece of unique sign into a sophisticated bathroom as essential elements of their space.